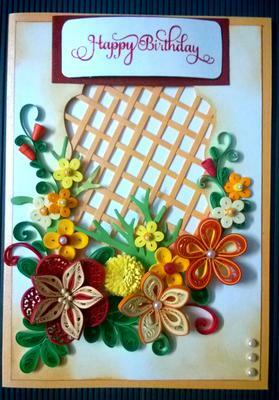 I have been awestruck by the trellis card by Christina and wanted to try. Opportunity knocked my door as my son's friend wanted a special card for his parent's 25th wedding anniversary. 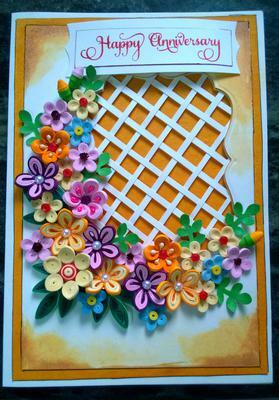 I ventured into making the trellis card and made 25 quilled flowers to mark 25 years of togetherness and small buds representing the bond growing. The couple loved the card and said that it was the best gift they ever received. I was happy that my attempt made someone's special day more memorable. Though I don't get good card stocks where I live, I made two trellis cards with whatever I had. These cards are first attempt and not perfect. But Christina has been an inspiration and her videos are very informative and clear and card making is made easy, simple and fun. 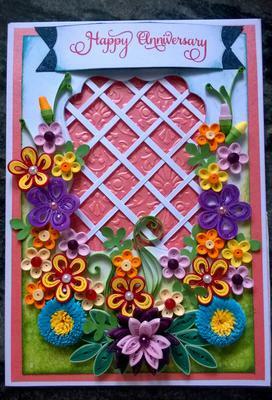 I usually decorate my cards with quilled flowers and these cards are made against order. Two for 25th wedding anniversary and one for birthday. Hope you like my work. Oh my what can I say ... these cards are so lovely, ALL of them, and if this is your first attempt at them then you should be really proud of yourself. Thank you Jovita, Kamala, Gloria and Edith.Dear Edith, you can do it with practise. you are an amazing person and everything you make is special and made with a lot of love.... its shows... God bless and keep growing beautifully in the craft world. Wonderful gayatri! Way to go! Congratulations on making such lovely cards. I have attempted to make flowers using the quilling method, and sadly I have failed to produce flowers like yours. The finished product is lovely as proves with your cards. Keep it up! Hello friends, thank you all for your lovely comments. Yes Nancy, I have bee quilling for almost 1 1/2 years. Still a long way to go. All your wishes has motivated me to try out more. Jenny, you also can improve your quilling, it's practice. Happy crafting friends. really very nice these cards. Oh Gayatri, your cards are just beautiful. I love the quilled flowers, they are really pretty. I wish I could make such a good job of quilling but I'm afraid I've not made good job when I've tried. If these are your first attempt at the trellis card then you've done a brilliant job. No wonder they were very well received. Take care and keep up the good work. What a stunning trio of cards, I just love these flowers,they really brighten the card, I'm not surprised the couple loved them. If that's your first attempt, what will you be producing in the future> ! Gayari, congratulations to you! Your cards are just lovely . . . and SO VERY unique. It appears that you have been quilling flowers for some time. They are so colorful, and just lovely! The cards are truly keepsakes and will be treasured by anyone lucky enough to receive one! Keep up the great work!